Growing Begonias Indoors & Outdoors-The begonia care instructions on this page are based on my 30 years of experience of growing begonias here in Texas. The begonia care instructions on this page are based on my 30 years of experience of growing begonias here in Texas. I know for a fact that begonias thrive in cool temperatures. I know this because they are at their best (growing robustly, healthy and blooming) in the spring and fall. 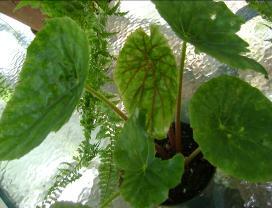 Begonias also root best in cooler temperatures. In the summer they slow down on their growing and I am constantly trying to move them to shadier places and if I keep some in the greenhouse I have a swamp cooler going along with a fan. It is exhausting trying to keep them happy! I started growing begonias in my bedroom when I was a teenager; that was my room and the only place I was allowed to have my stuff without any one moving it around. The rest of the house and yard belonged to my Mom! She didn’t believe I could grow anything. Oh yeah I proved her wrong! So I know by experience you can grow any houseplant you want in your home provided you give them the right light, temperature, water them as they need it and give them the humidity they need or don’t need. I started with begonias first, then gloxinias, cactus, succulents, prayer plants, you name it I grew it! My room was a Jungle! Episcias were the last plants I decided to grow only because my mom loved them and she tried many times to grow them but they just died. She finally gave up on them; so of course I gave them a try, after all I grew gloxinias how much harder could a episcia be to grow! I did the opposite of what my mom did; I did not baby them in fact it was summer time when I decided to grow them so I put them outside on the patio with some of my begonias. What a surprise they thrived in the Texas heat leaving my begonias to shame! 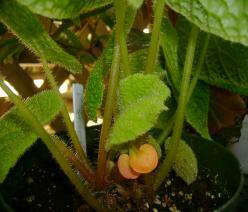 Begonias like cool temperatures that range between 58 thru 72 degrees, they like the cooler temperature at night. Begonias grow at their best at these temperatures. As we all know some places get well above these temperatures! If temperatures are to low plants won’t grow and the soil will stay wet. If the temperature is too high the leaves look weak and feel dry and start to drop. If you will be growing begonias outside where temperatures go up into the 90’s and 100’s make sure they are protected from the sun, grow them under trees or on a patio with a cover. 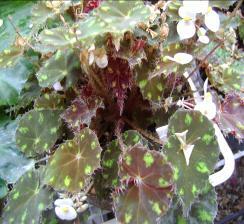 You will be surprised how some begonias tolerate the heat outside! Angel Wing Begonias grow very well in these conditions as do most of the rhizomatous and fibrous shrub type begonias. Stay away from Rex Begonias or begonias that need to be grown in terrariums they will not survive; unless you are lucky enough to have a greenhouse with controlled temperatures; sometimes a swamp cooler might help. You can always try to grow the Rex begonias indoors. 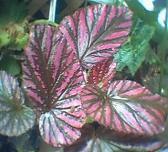 Please be aware that any temperature change will cause begonia leaves to drop. Please give them time to adapt to your climate. 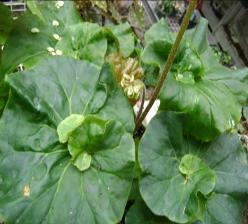 Begonias do not like wet soil; please make sure the soil is almost dry before you water them. 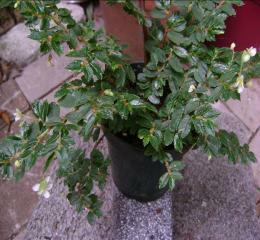 Sudden extreme changes in temperature will cause the flower buds and leaves to drop! 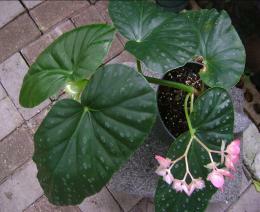 It does not matter if you place them indoors or outside, any drastic changes in temperatures will affect the begonia. If you are going to grow your begonia indoors do not place them close to doors where cold air comes in, do not place close to air conditioning, and heat radiators. Placing them on a tray with pebbles will help give them the extra humidity they need. Group a lot of plants together this will help with the humidity. In the Summer I fertilize every time I water (Miracle grow, peters, fish emulsion, etc.) and use plain water once a month. I do not fertilize during the winter. Growing begonias indoors: in the summer the best place to grow begonias is placing them by a north and east window; in the winter place them by a south and west window. 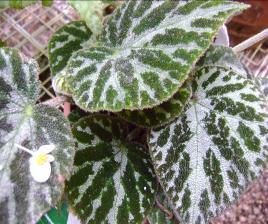 Rex Begonias grow better under florescent lights in the winter and in the summer. Growing begonias outdoors: Angel wing begonias, shrub begonias and some rhizomatous begonias like growing under trees that provide plenty of filtered light. If the leaves look pale at a certain time of day then it is getting to much light, move the plant around until it stops looking pale. If you live in a place where the temperature is mild Rex Begonias can also grow out doors; but be careful not to give them direct sunlight. Insufficient light: If your plant is getting the right amount of light it will grow compact and the leaves and stems will look healthy and have vibrant luscious leaves. If the stems are becoming leggy and limp on your begonia and is stretching towards the light and it begins to grow very thin looking and tall; instead of bushy then it is not getting enough light. 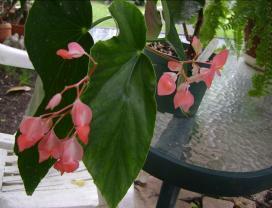 If your begonia doesn’t get enough light it won’t produce flowers and it won’t bloom profusely. Too much light: will cause leaves to burn and turn pale. Move them to a shadier place until leaves stop looking pale. In the spring begonias can tolerate the morning sun, but when it starts to get hot in the summer you will need to move them to a shadier place. Please do not over water your begonias! They do not like to be wet! Let them get almost dry before you water them. In the fall and spring this watering system works. 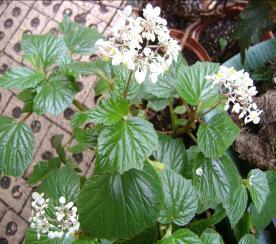 In the summer especially for rhizomatous begonias it is very hard to keep them happy! It does not matter how careful you are when you water them. Rhizomatous begonias do not like the heat or too much humidity very well; so keep them in an area where they get good air circulation! I have trouble keeping the rhizomatous begonias happy in the summer. Sometimes watering the rhizomatous begonias when they are almost dry doesn’t work. Some of them tend to rot at the soil. This is because of the heat and too much humidity. Remember these instructions are based on my experience of growing begonias here in Texas. It is different in other parts of the U.S. 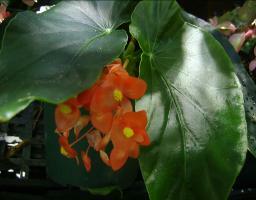 In the winter begonias can tolerate cooler temperatures. If it doesn’t freeze in your area most of them can be left outside year round. I put my begonias in the greenhouse before the first freeze. I do not use the heater in the greenhouse unless the temperature goes below 40 degrees. You will be surprised to see some of your begonias bounce back from the summer heat! They start growing and blooming again even through the winter. Of course some of the begonias need warmer temperatures in the winter than others. As you start collecting and growing all the different begonia species you will learn which ones are the finicky ones and which ones or not, just by looking at the texture and color of their leaves and the size they grow. I love large leaved tall growing huge begonias! They are usually the easiest to grow. Terrarium grower. 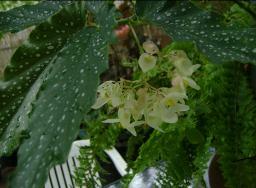 My begonia staudii is growing outside of a terrarium and blooming in the winter.